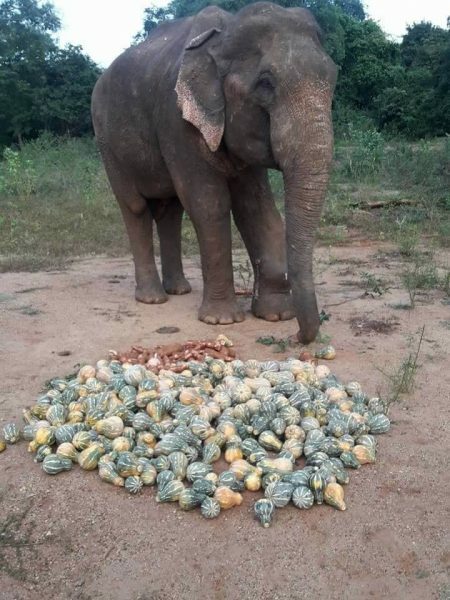 In March 2018, Cee4life were approached by a conservationist in Sri Lanka who was seeking aid to a wild elephant named Raju, who had been shot while foraging and those bullets were still lodged in his legs. After a myriad of logistical problems, Raju received the Veterinary expertise in June 2018. The complex operation to remove the bullets would be done in late July 2018 by the brilliant Veterinarians from Four Paws. Sadly, due to troubling circumstances occurring between 30th June 2018 – 2nd July 2018, Raju passed away. Cee4life continues to work with Sri Lankan NGO’s for the conservation, protection and education for the animals. The Javanese Leopard (Panthera pardus melas) has been listed as critically endangered since 2008 on the IUCN Redlist. 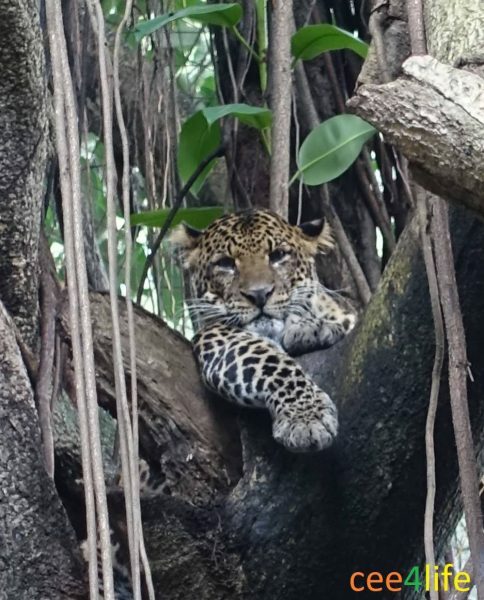 There are approximately 250 or less adult Javanese leopards left in the wild, which are found in the western region on the island of Java, Indonesia. The Javanese Leopards are also known as the “Tree Tiger” due to their ability to climb and spend the majority of their time in the trees. The climbing abilities of all sub species of leopards are renowned, however in comparison to other sub-species of leopard, the Javan Leopard is smaller, with a body length of 100 cm – 160 cm and a height of 70 cm – 105 cm, which enables them to be incredibly agile in the forest environment. The lifespan of a Javan Leopard is approximately 18 – 22 years old. Within Bandung Zoological Gardens all of the leopards have reached tremendous ages of 20+ years, the oldest being 26 years old. The animals in Bandung Zoological Gardens are some of the most critically endangered species left on earth. 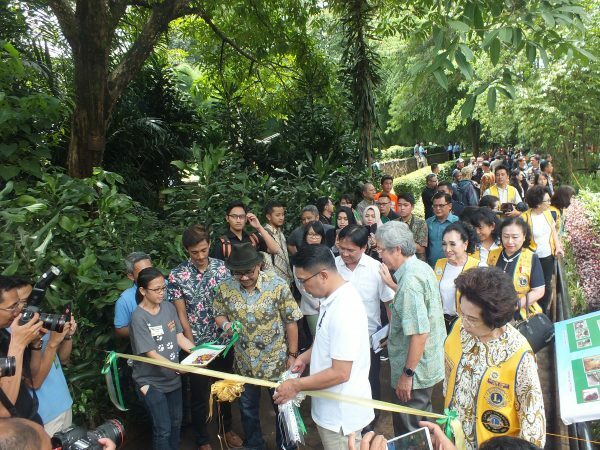 Bandung Zoological Gardens has dedicated themselves to a full upgrade of their facility. 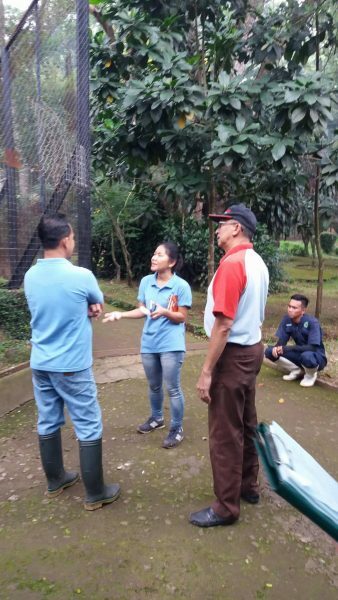 This upgrade began in May 2016 when the Indonesian Zoos and Aquariums and Taman Safari Bogor joined with Bandung Zoological Gardens to map out the complete upgrading of enclosures, dietary needs, permanent veterinarians, other infrastructure upgrades and much more. Cee4life joined to help in March 2017 aiding animals where possible, advisory role, and the design and implementation of multiple education programs. As with many of the larger captive venues in Indonesia, the designs are old and outdated, with many being built in the 1930’s. Since that time, leaps and bounds have been made across the world on the needs of animals in captive environments. Throughout 2016 – 2017, upgrades of enclosures have been implemented on the many varying species and will continue throughout 2018 onward until it is completed. 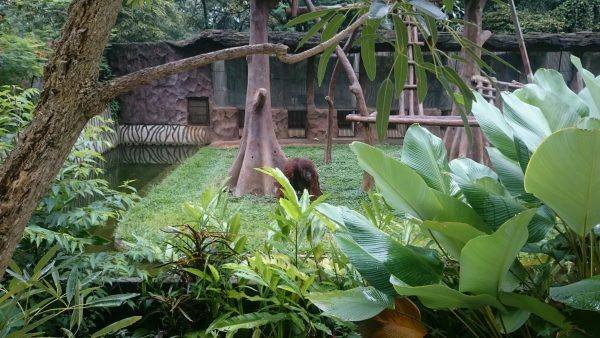 This is the first time that a privately owned captive venue in Indonesia has agreed to such a massive overhaul. The Javan Leopards enclosure is currently underway with construction hoped to be completed by mid year. As with all these enclosures, building can be delayed due to the geography of the land and erosion factors. 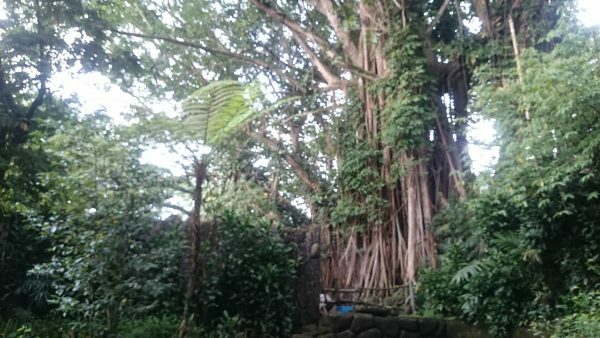 The upgrading of this enclosure includes soil stabilisation, new den, climbing and enrichment areas, the Asian Banyan tree will remain within the enclosure, new water points, and new fencing. 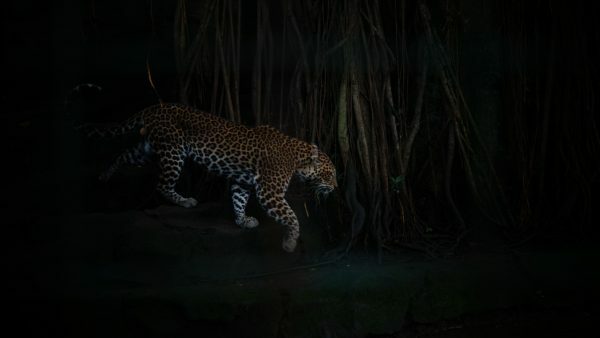 An educational sky-walk is currently being decided upon which may run throughout Bandung Zoological Gardens and may include the Javan leopards, which would allow visitors to see a different view of these most critically endangered leopards. The enclosures themselves have been designed to reflect the Javanese culture and the den area has been designed with authentic Javanese housing replication and artwork from the West Javan area, which these leopards originate from. Educational information will be placed at the front of the enclosure and additional trained educators will provide roving education (in place now) for visitors. The leopards, Sughi, Bethy and Mia are in extraordinary health for 20+ year old leopards. 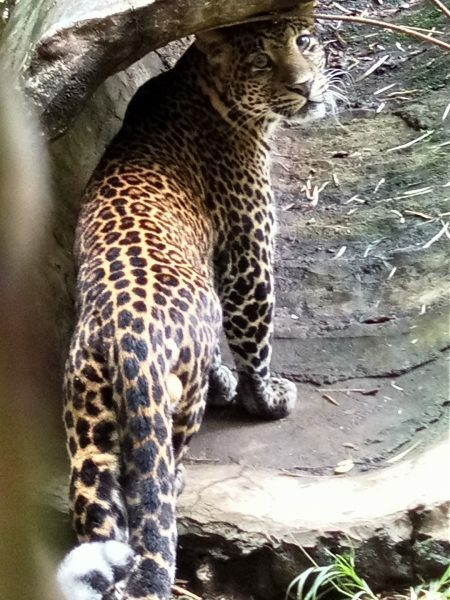 Due to the critical status of the Javanese Leopards a huge effort to save the species from extinction has begun and these beautiful leopards are also included in the education programs within Bandung Zoological Gardens. This is an extraordinary and immense undertaking for a captive venue in Indonesia, and one that is setting a precedent for higher standards in captive animal care within the country. Its a long journey and patience is required, but with every step made, the goal is getting closer. 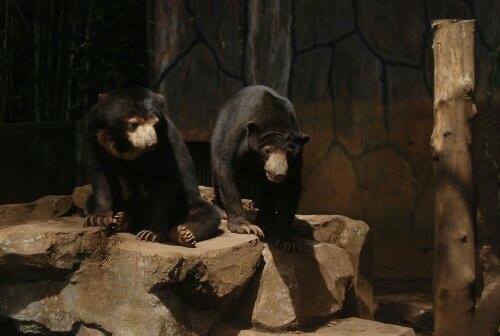 It’s been over two years since the viral video of the Bandung Zoological Gardens sun-bears was released in May 2016. 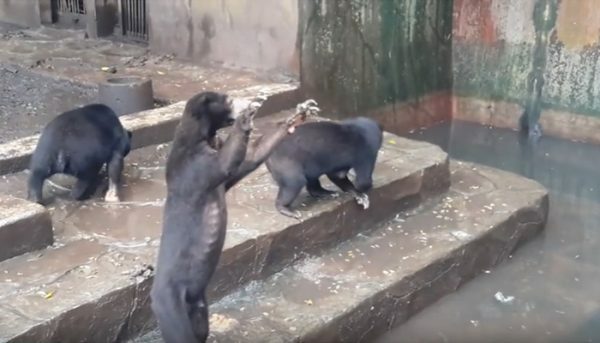 At the time of that video release, the Indonesian Zoos and Aquariums (PKBSI) were already in Bandung Zoological Gardens and confirmed that there were no starving sun-bears or any other animals. Other organisations from around the world had also confirmed this. Due to the downwards filming and headlines of “starvation”, the video went viral and an outcry from around the world began. As with many viral episodes, it is highly advised to do your research before signing petitions and donating to random fundraisers or writing articles about it. 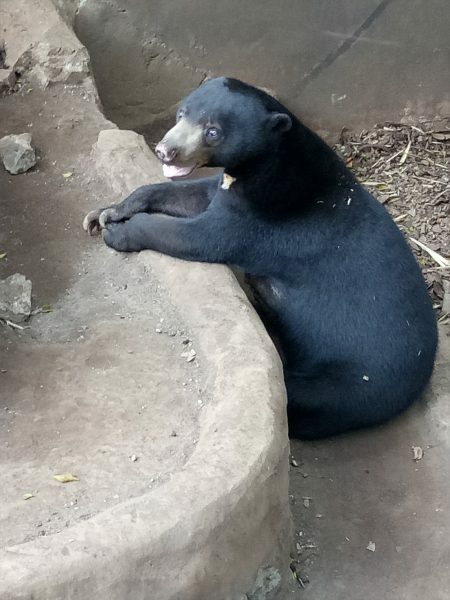 On the viral video that has been seen by millions of people and media around the world, the focus was on a particular sun-bear who was filmed at a downward angle and enticed with food to stand up. 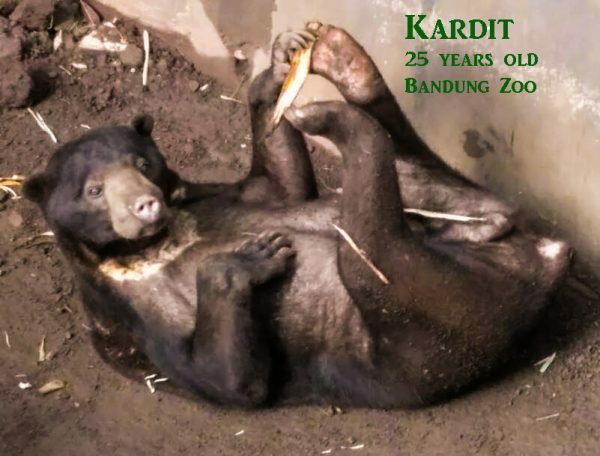 The sun-bear focused on in the film is named Kardit, who is the oldest sun-bear in Bandung Zoological Gardens. 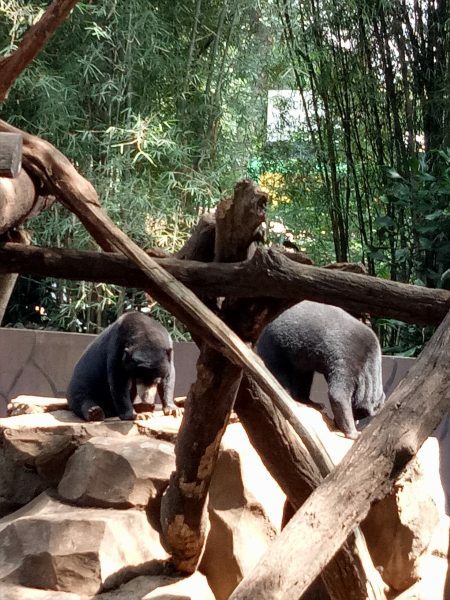 While the washed out film definitely showed an enclosure in need of upgrading, there was no context to the film and it was not a true depiction of the situation of the sun-bears or the journey that Bandung Zoological Gardens had just undertaken. Kardit, who was then 25 years old at the time, was what is classed as at the end of his life span. 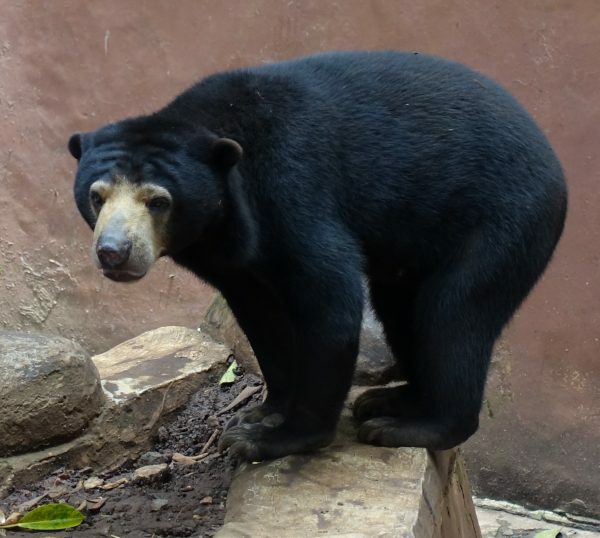 A sun-bear stands approximately 4 feet tall and has an average lifespan between 23 – 25 years. Soon after the video was released in May 2016, Kardit turned 26 years old. Two years later the “starving sun-bear” Kardit, is still alive and healthy and entering his 28th year. Kardit is equivalent to a 90 year old human being. The photo below on the left was published by Zee News which is a still shot taken from the viral video. Kardit is the sun-bear standing up. 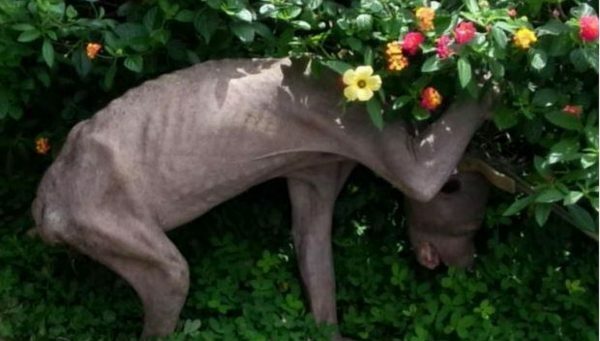 While you can certainly see Kardit’s ribs and elongated fingers, the world didn’t know that Kardit was at the end of his lifespan, that he didn’t like climbing trees much anymore, that he lost muscle tone just as all mammals do with age, and that he was being enticed to beg for the food. The two other sun-bears in that same photograph, Putri and Anon (5 years old at the time), are by no means starving. But of course Kardit raised alarm and the old in ground 1933 enclosure needed upgrading. 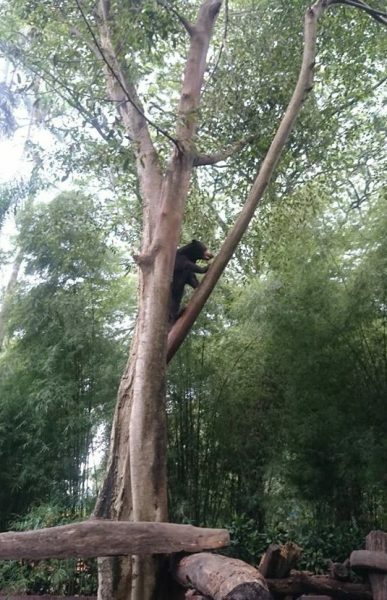 In January 2015, a starving and sick sun-bear was found in Sarawak. 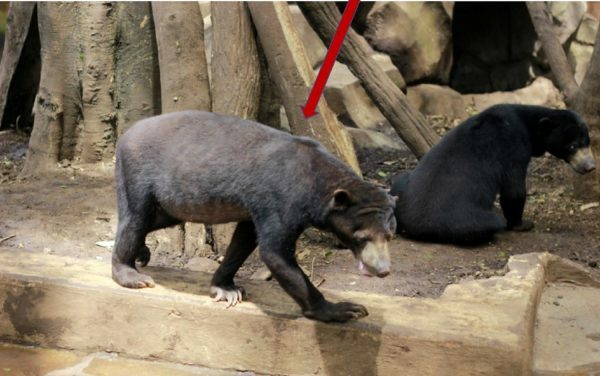 The Straight Times published a few pictures of this sun-bear seen on the right. Kardit, Anon and Putri of Bandung looked nothing like this. On the 23rd January 2017, Cee4life were notified numerous times of “starving sun-bears” in Bandung Zoological Gardens and we were urged to help. 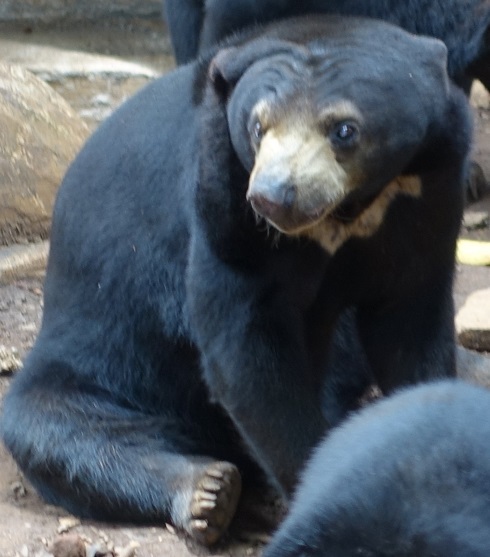 We too saw the video and were concerned about Kardit the sun bear. We contacted the Indonesian Zoos and Aquariums on the 23rd January 2017 and received a thorough report by 25th January 2017 . 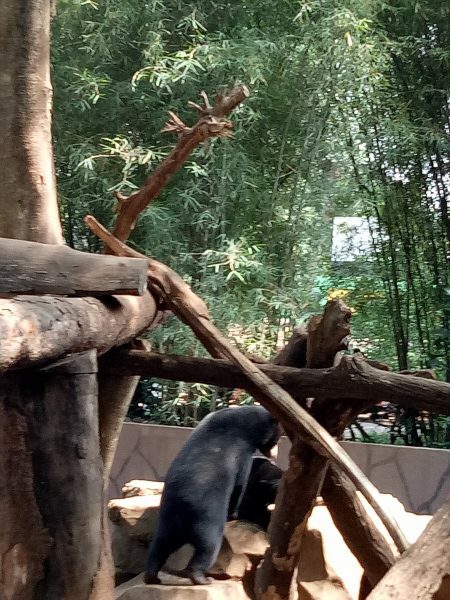 We understood immediately that there was no starvation in Bandung Zoological Gardens and that Kardit was a very old sun-bear. 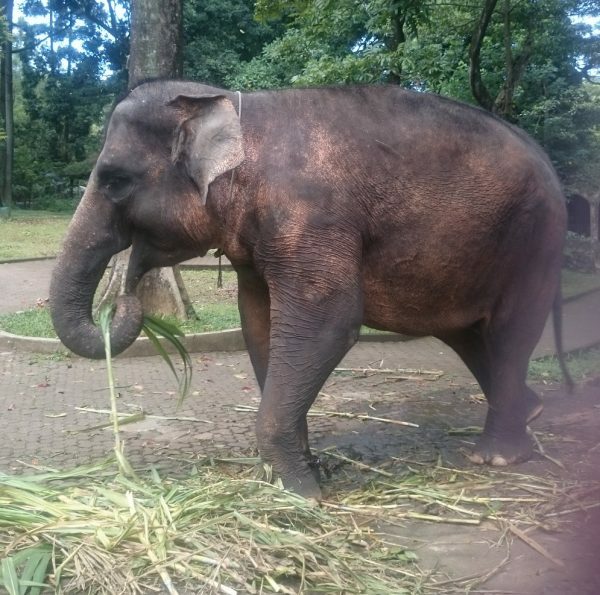 We also understood that the Indonesian Zoos and Aquariums had been inside the Bandung Zoological Gardens since May 2016 upgrading enclosures, providing a more balanced diet to all animals, enlisted Veterinarians, new management, had brought in keepers from Taman Safari Bogor and much more. We also understood that there was never going to be a re home or release of the sun-bears, and we also understood that there had been a great deal of misleading information placed into the public forum. Cee4life immediately reported on the facts in January 2017 and provided photographic evidence of Kardit to reassure the public that there was no starvation. 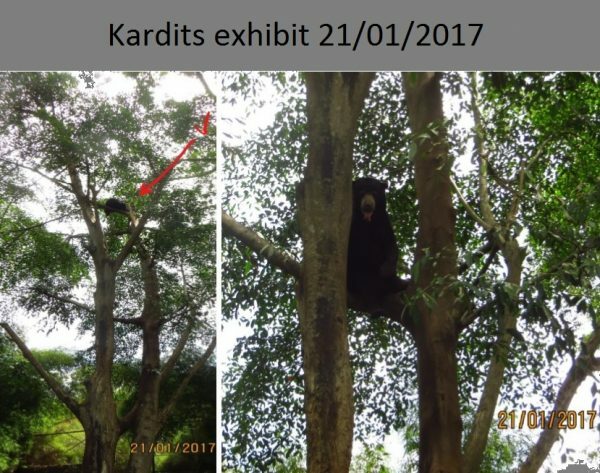 The photograph below left is of Kardit provided to us from the January 2017 report from the Indonesian Zoos and Aquarium. 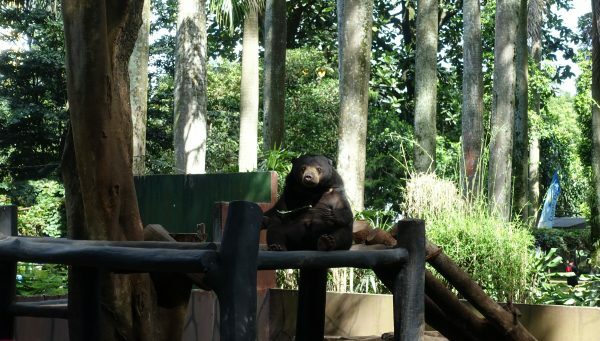 The sun-bear in the background is the female named Riri. It was clear to see that this was true colour and there was no starvation. However, the viral episode continued to race across social media and some main stream media. Over the following months it was discovered that petitions on Change.org had been created and GoFundMe campaigns had been created, both using highly misleading and false information. Both garnered thousands of signatures and thousands of dollars. 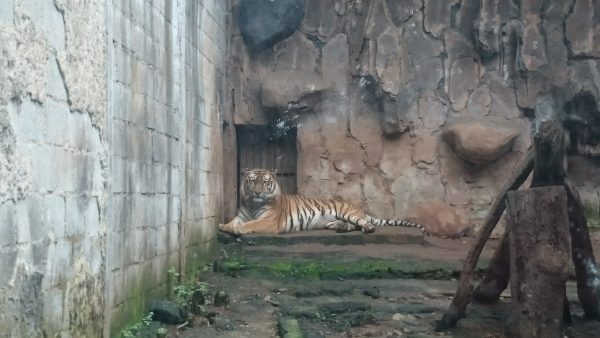 No funds were ever given to Bandung Zoological Gardens from the GoFundMe campaign, and the petition is rendered null and void with Indonesian authorities. This is one of the very dangerous things about social media. We urge everyone to do their research carefully and intelligently. While authentic organisations work tirelessly aiding animals, other people take advantage of the situation for reasons only they can answer. At this point we would like to dispel any confusion and state clearly that Cee4life do not own Bandung Zoological Gardens. We are guest in the country to help the animals where we can and provide education on conservation, kindness and compassion to animals. 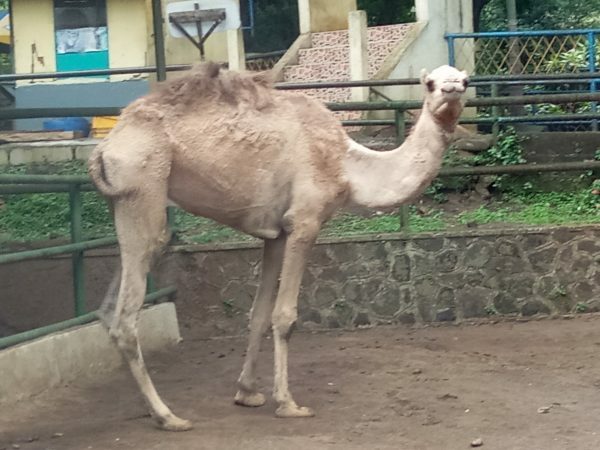 Cee4life have been helping Bandung Zoological Gardens since March 2017 with aid to the animals, on an advisory capacity when possible, and the implementation of education programs. We will continue to help to the best of our ability until completion. We would like the public to understand that Indonesia is a developing country and not a 1st world country. As with many areas of the world there are cultural, social, economic, religious, other union like business’s and political aspects that must be respected when working within a foreign country helping animals and/or provide education. Nothing can be achieved without understanding and respect and change takes time. While we would all love to see animals running free, it is humans who placed animals in captivity and many can never be released. It is also fact that the wild habitat of many animals on earth is so diminished that extinction is inevitable. In these days that we are living in, the nightmare of animal lovers and conservationists is coming true ie: the only places that some animals will be seen is in captivity. It is humans responsibility to ensure that if an animal is living in captivity that they are given the five freedoms. Bandung Zoological Gardens has dedicated themselves to implement the five freedoms to the very best standard they can. 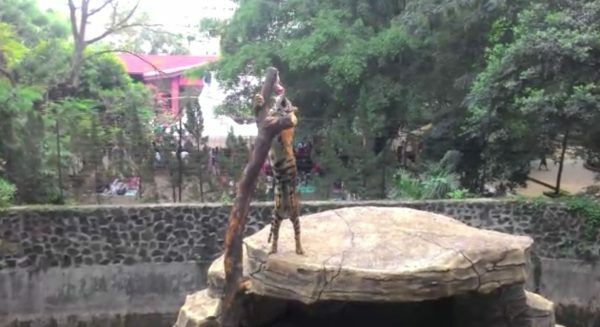 This is the first time a privately owned zoological garden has done this in Indonesia, a still developing country, and this dedication to their animals should be supported. Today, the sun-bears are very healthy and awaiting the unveiling of their new enclosure upgrade in approximately late August 2018. Even now, when Kardit stands up and stretches his arms, you can see his ribs, not because of starvation, but because of age. Below are a series of photographs we recently took of the sun-bears. Please be assured that there is no starvation in Bandung Zoological Gardens and please be patient while the upgrades continue. These animals need your love so please give it to them. Work continues on the first of a number of renovations for a section of the geriatric big cats enclosures. 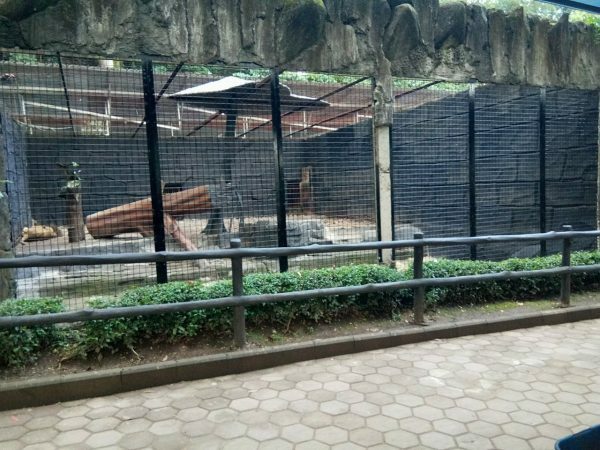 Bandung Zoological Gardens will continue their dedication to upgrade the enclosures of all the animals until it is finished. 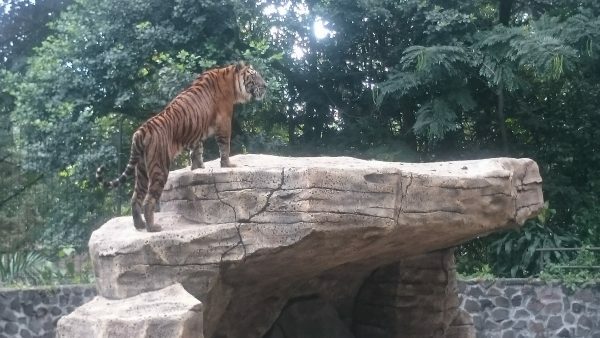 This is the first time in Indonesian history that a public zoological garden has committed themselves to such a massive overhaul of their facilities. The aim is to provide the five freedoms to the animals within the zoological gardens to the best standard they can. The teams aiding and supporting these efforts are the Bandung Zoological Gardens management and staff, Indonesian Zoos and Aquariums, and Taman Safari Bogor, with a growing list of support from multiple partner organisations Lions Club, Cee4life, Silent Forest, Kasi, Accor Hotel Group, Novotel, Bandung Community, University of Bandung, Jakarta student support and more. 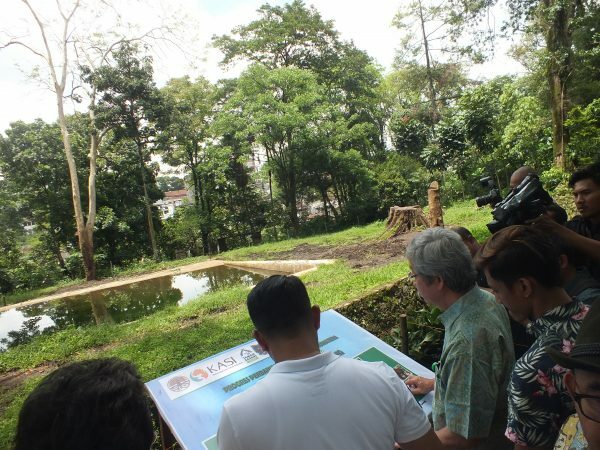 The Office of the Mayor of Bandung officially opened the elephants enclosure and was shown other upgrades and the projected timeline of other renovations in late 2017. This is an extraordinary effort for a captive facility in Indonesia. 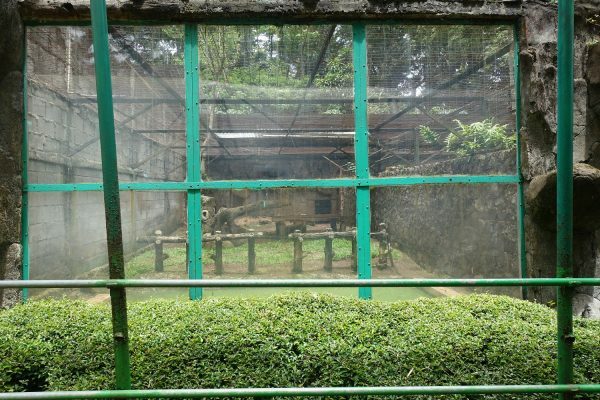 As Bandung Zoological Gardens continues to undergo a full renovation, the big cats enclosures has always been a major issue. When upgrading a zoo like this, the problems with renovations for the large animals (elephants, tigers, bears, etc) is how to rotate them into other areas while the renovations occur. Its obviously too dangerous to have these big animals around while construction occurs, so moving them into other enclosures or areas while upgrades continue is a big operation. This particular area houses seven adult big cats which includes four lions and three tigers ranging in age from nine to twenty seven years old. The renovations on these enclosures includes removal of walls to extend the enclosures, removal of thick perspex and replacement of big cat enclosure fencing, upgrade of pond areas including filtration system, inclusion of various enrichment items, platforms, shaded areas and scratching poles. This renovation on the entire zoo will take at least 2 years or more to complete, depending on geography issues, construction issues, and finances. Bandung Zoological Gardens Team includes – Bandung Zoo staff, Indonesian Zoos and Aquariums (PKBSI), Taman Safari Bogor, Cee4life, KASI, Silent Forest. We will update further on the big cat renovations in the future. 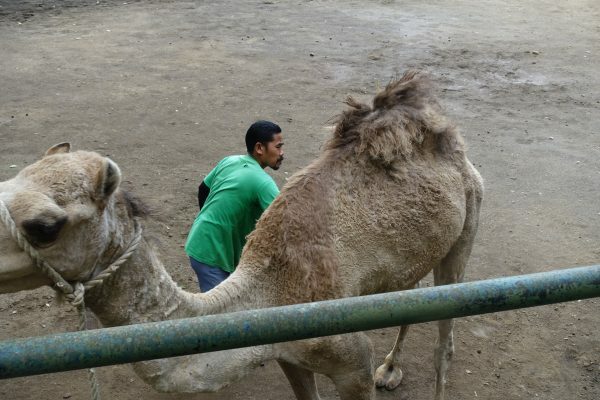 Bandung Zoological Gardens has four beautiful Dromedary camels, one of which recently featured on some social media sites. The camel at the center of attention is named Ramadan. The picture circulating was taken of Ramadan over one month ago and showed him thinner than usual. While Ramadan had certainly lost some weight, he’s on the road to full health now. Ramadan is approximately 30 years old. The life expectancy of Dromedary camels is around 40 years old, so Ramadan is not a spring chicken! Not long ago Ramadan began to have digestion problems. After the Veterinarians examined him, it was found that he had a tumor in his intestines. He was operated on immediately and the tumor was removed. After a short recovery time, Ramadans appetite has increased back to normal and he has been putting on weight and his health is getting back to normal. We look forward to this lovely boy being back to 100% health very soon. In the meantime, Ramadan is being cared for wonderfully by the Veterinarians and his keeper. Ramadan is very loved and has a wonderful relationship with his keeper. Here he is above getting his daily brushing 14th Feb 2018. We love that people care so much about the animals of Bandung Zoological Gardens and we encourage you to write to us at Cee4life or to Bandung Zoological Gardens if you have any questions about the animals. Bandung Zoological Gardens has dedicated themselves to upgrading the entire zoo over a couple of years. 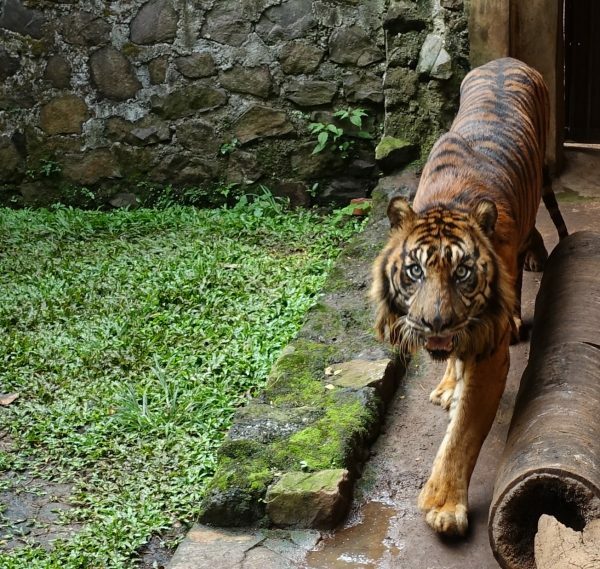 This is the first time that a zoo in Indonesia has committed to such a massive upgrade. The story of Bandung Zoo is inspirational, uplifting and a challenging and wonderful journey. The Bandung Zoo Team consists of Bandung Zoo staff, Indonesian Zoo’s and Aquariums (PKBSI) , Taman Safari Bogor, Cee4life, KASI, Silent Forest and support from the Bandung community, schools and Universities and the Office of the Mayor of Bandung. Keep Ramadan in your thoughts as he recovers to full health. 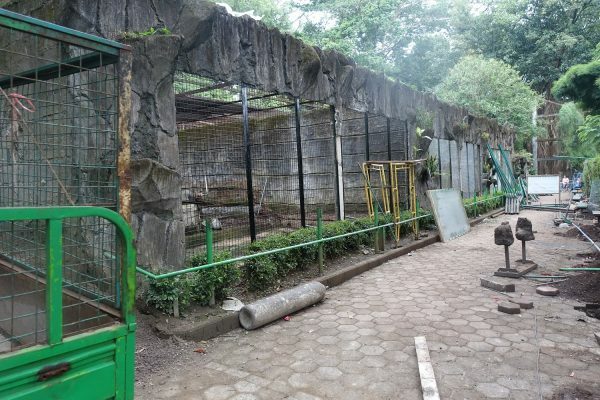 Upgrading work on the sunbear enclosure has begun in Bandung Zoo. Over the next few weeks building upgrades will continue on the first enclosure, then later followed by a second new enclosure. 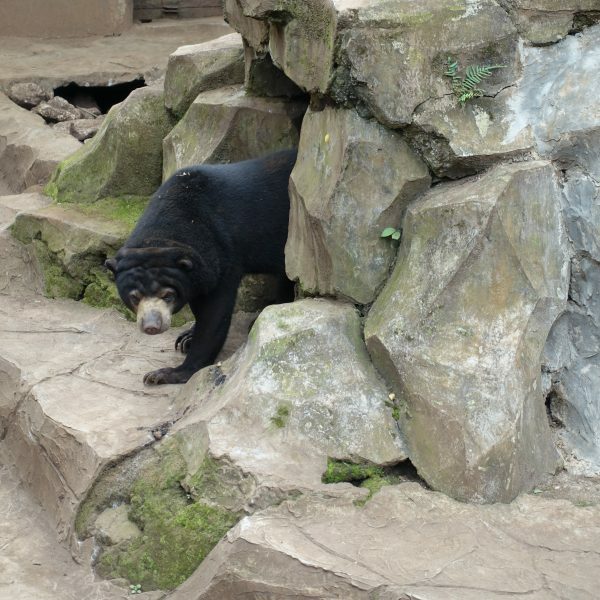 The sunbears of Bandung Zoological Gardens have been the focus of world wide media due to a viral video alleging that the sunbears were starving. 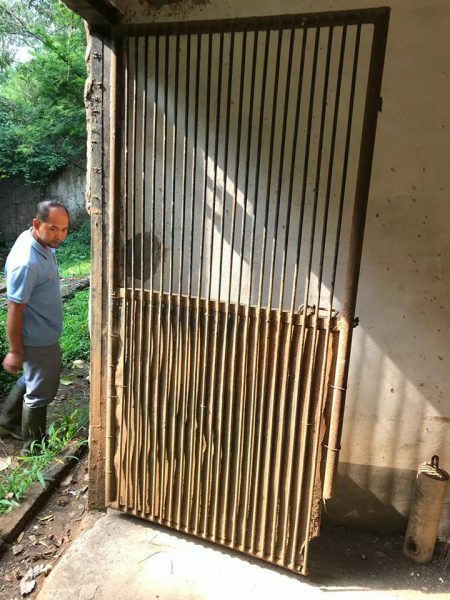 After a number of organisations visited the Bandung Zoo in early 2017, it was been found that there was no starvation of any of the animals and the PKBSI (Indonesia Zoos and Aquariums) had been working with Bandung Zoo since 2016 to upgrade the zoo. 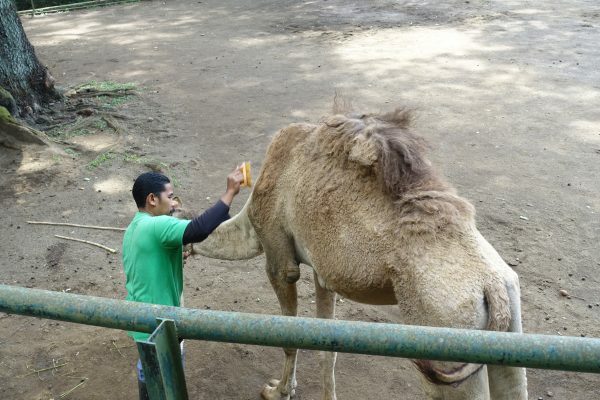 Cee4life partnered with the Bandung Zoological Gardens in March 2017 to provide assistance to the animals and implement a series of education programs. Bandung Zoological Gardens is undergoing a complete overhaul to bring the standards of the animals welfare to a higher level. Over the last few months, work on upgrading another tiger enclosure has been underway. Bandung Zoo was built in the 1930’s and the designs of holding areas and dens for the animals were obviously outdated. Due to the old designs of enclosures and the way they were structurally built in the 1930’s, it has caused a lot of technicalities and upgrading is a little more complex than usual. 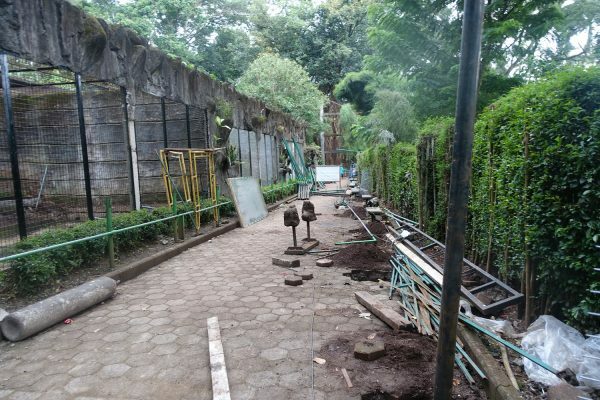 The infrastructure upgrades within Bandung Zoo are not a straight forward “pull down the old enclosures and build new”. It involves a combination of issues including topography mapping, water flow identification, soil erosion, and ground stabilization to name just a few obstacles. The situation with the elephants enclosure is a good example of erosion problems that can surface. Tigers need enrichment and space to move, jump, climb, rest and a safe and secure den area. While the 1930’s den designs were simply unsafe, the outside green area was decent enough but needed a bit of work with landscaping, shade, enrichment and platform areas. The internal dens have been the main problem being not only unsafe and outdated, but also water leakage and structure stability problems. Below are some photographs of the original enclosure dens. The old 1930’s designs, water leakage, rusting and highly unsafe for tigers. 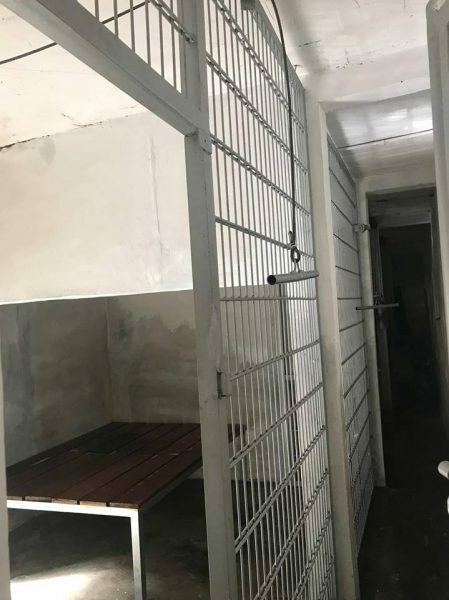 Below – The inside den areas have been renovated over the last few months and are now ready for the tigers to be moved to them. Ground stabilization, drainage, water proofing, flooring, security etc have all been installed and the dens are now ready. The tiger cubs will be introduced into their new enclosure within the next week and we will update. 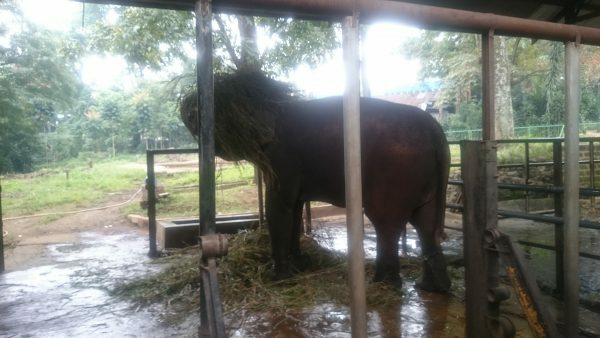 The animals in Bandung Zoological Gardens cannot be removed, re-homed or released. 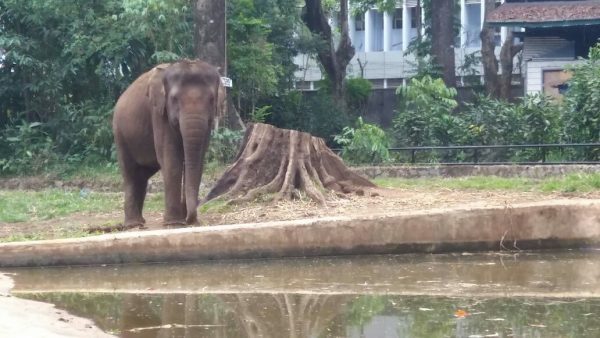 The decision to upgrade Bandung Zoo was made in early 2016 for good reason. Indonesia has 61 zoos and sanctuaries, only 4 of them are A grade standard. 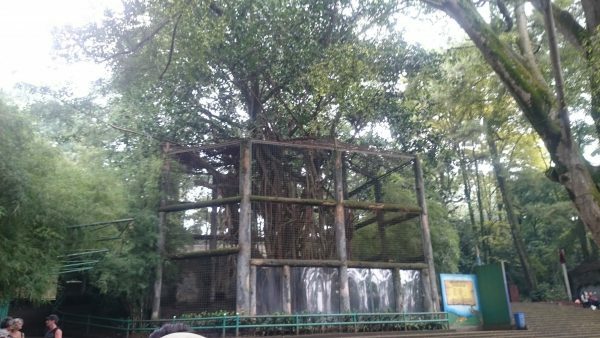 Out of the 61 zoos and sanctuaries, Bandung Zoo rates at number 14. There are literally thousands of critically endangered animals in captivity in Indonesia, most of whom have no survival skills and if they were released, they would be dead within days if not hours, by the hand of humans. 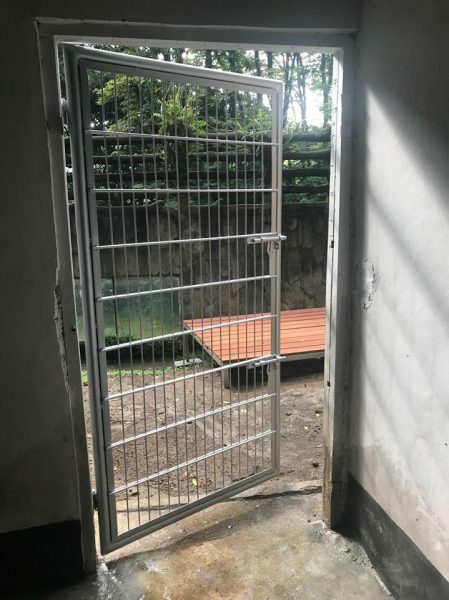 Because of this situation and as Bandung Zoological Gardens realised the animals in their care needed more, they dedicated themselves to upgrade to the highest standard of care that they can. 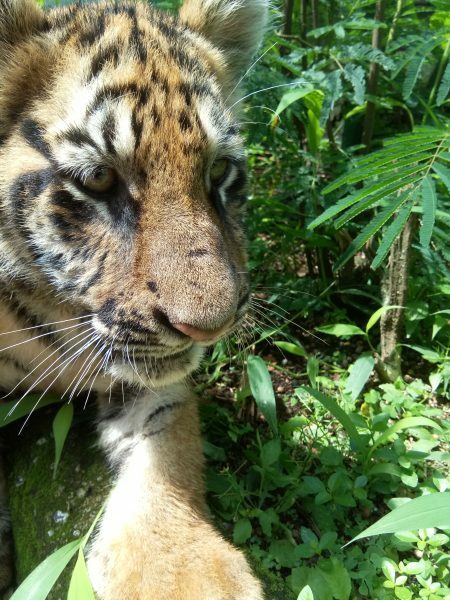 This is the first time that a zoo in Indonesia has very publicly acknowledged the need to provide animals with a high standard of care incorporating the Five Freedoms. Due to massive habitat loss and poaching in the forests of Indonesia, the wild animals are struggling to survive. For example, there are approximately 300 Sumatran tigers left in the wild in Indonesia, out of that 300 it is feared possibly half of the population is or will be infected with a disease reminiscent of canine distemper, that there is no current cure for with tigers. While we all would like to have every animal in the world roaming free, the reality is, we are living in times where we are losing multiple wild species. 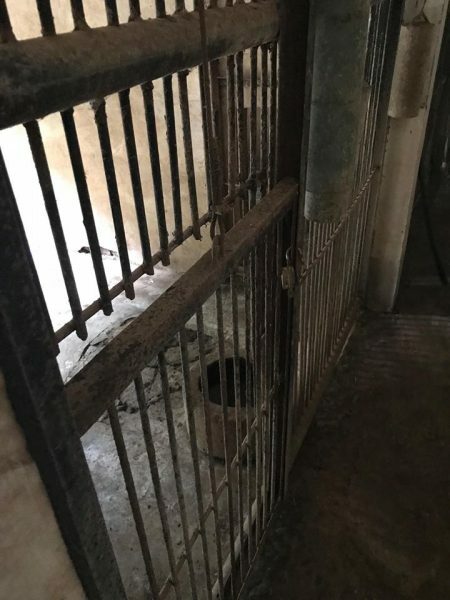 The nightmare that all conservationists have is coming true – one day the only place to see some of these animals will be in captivity (eg: South Chinese Tiger). If sanctuaries and zoological gardens are not provided for species, we will lose them completely. Another example, in one sanctuary in Indonesia, there are a few rescued attempted poached wild tigers that have been saved and given quality of life. These very few critically endangered tigers are some of the last of the pure wild Sumatran tiger genetics. This scenario is happening all over the world. There is no doubt nature and the environment is declining rapidly and we will continue to see many species vanish from the wild. While extensive efforts are being made by multiple organisations to protect the wild animals, humans still encroach into nature and destroy the animals habitat, poaching still goes on and anti poaching is not currently extensive enough to stop it. 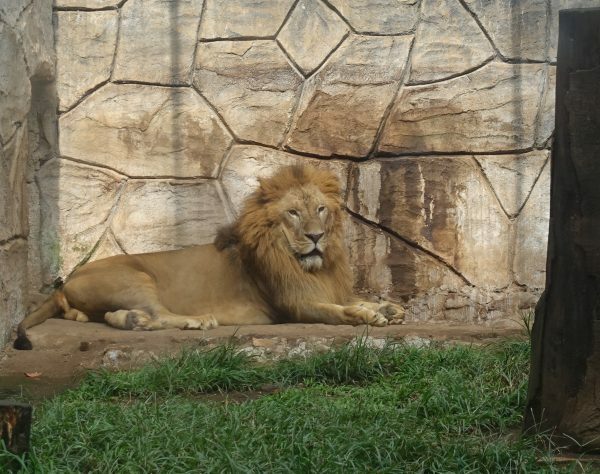 Bandung Zoological Gardens is striving to meet the Five Freedoms for all of their animals. It will take time, but it is happening. Protect the wild animals, provide sanctuary for those that must live in captivity. 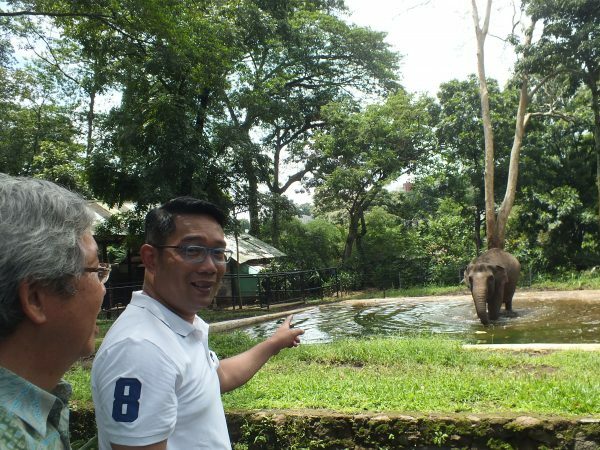 After delays with erosion problems and ground reinforcement issues, on the 18th November 2017, the Elephants of Kebun Binatang Bandung KBB (Bandung Zooloogical Gardens), Ira and Shelma, had their enclosure officially opened, by the Mayor of Bandung, Ridwan Kamil. The KBB dedicated itself to create a much higher standard of living environment for the animals under their care. 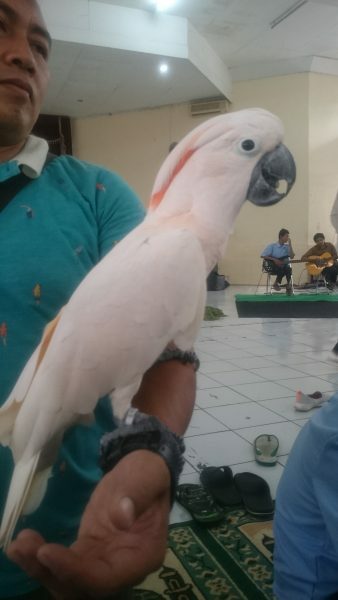 In early 2017, KBB formed a team of dedicated animal organisations and professionals including PKBSI (Indonesian Zoos and Aquariums, Taman Safari Bogor, Bandung Zoo staff, and the Australian Cee4life NGO (Conservation and Environmental Education 4 Life), to join together united and strive to find solutions to make KBB a place of peace for the animals and inspiration for other zoos in Indonesia and abroad, to follow. The Elephants, Ira and Shelma, were full of positive joy once that ribbon was cut and put on quite a display for Mayor Ridwan Kamil and all those that joined in. 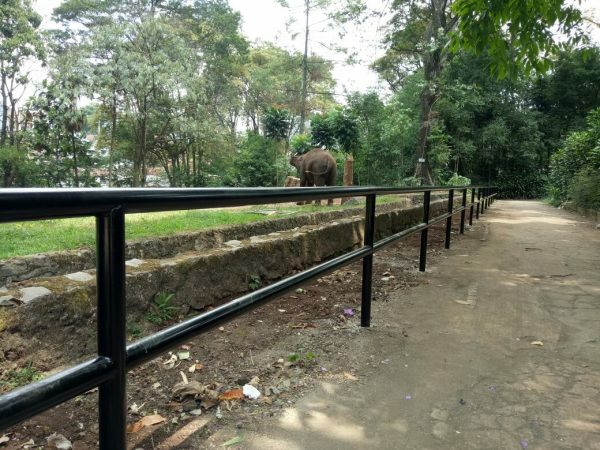 An international effort was required to build the elephants enclosure utilizing the expertise of Dr Tony Sumampau for design and enrichment, Bandung Zoo, Bandung locals and Taman Safari staff for building of the enclosures and the organisation Cee4life for providing the electrical fencing equipment of a new type of fencing for the elephants and other enrichment solutions. 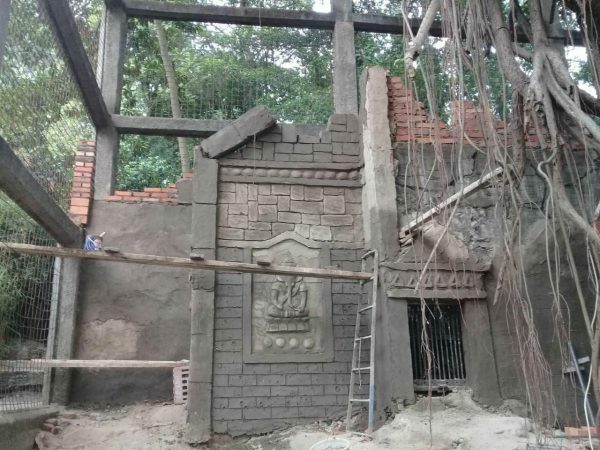 In September the elephants were released into the enclosure off their chains, however as weather elements and erosion occurred, a massive effort began to secure the enclosure once again. There is still a small amount of infrastructure left to complete on the elephants enclosures to ensure the poles of the den are fixed solidly. This day has been a long time coming and we are all so excited and happy to have reached this first of many milestones for the animals that must be in captivity. Today is a good day for the elephants. 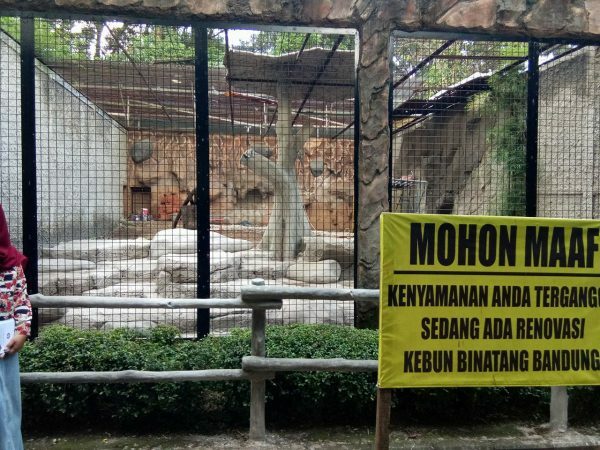 Bandung Zoo has endured through one of the biggest negative online campaigns seen in recent history which included slanderous, defamatory and very misleading information. 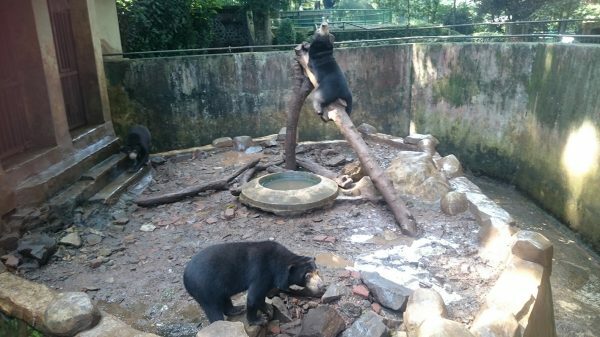 While there has been numerous fundraisers appear in the public forum for Bandung Zoo, especially the sun-bears, no aid has reached the zoo from any of these online sources. Please be careful of who you donate to. 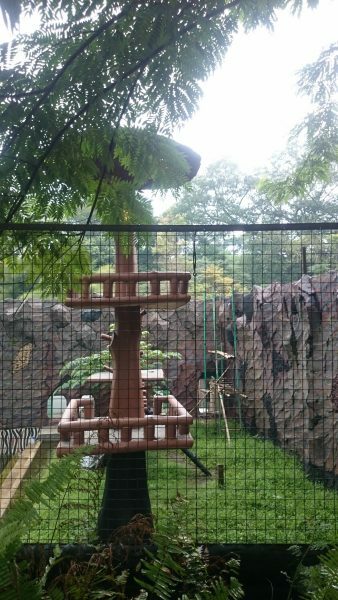 On the 18th September 2017, work was completed on the new enclosure for the elephants of Bandung Zoological Gardens. We are extraordinarily happy to announce that the resident elephants, Selma and Ira, are now unchained and free to roam at will. The enclosure and holding dens of the elephants had decayed after years of exposure to the natural elements and lack of maintenance. The fencing of the enclosure had fallen down in sections and the holding area had numerous broken poles. This caused the elephants to be chained and restricted all movement. Although Selma and Ira remained very healthy, it was obviously not humane to have these intelligent beings chained 24/7. While work began on the enclosure approximately 4 months ago, we worked to have the heavy chaining removed (3 feet chained) and to get Selma and Ira walking daily for long distances. Bullhooks that were used daily have been put aside and only available under emergency situations. (Bullhooks were originally designed only to be used in emergency situations. In some places, bullhooks became a tool of utter abuse). This was achieved by education and training. Under Veterinary supervision, the diet of the elephants was also up-scaled. With increased physical activity and dietary changes, the physical appearance of Selma and Ira began to change to a more positive healthy definition and their demeanor became more relaxed. They began to express positive behaviors and became more “joyful”. However, the goal was always to get both female elephants completely off their chains. This was achieved by replacing the old outside enclosure fencing with electrical fencing and the holding dens had to be completely rebuilt. Some of the equipment was sourced in Bandung and some of the sourced and brought from Melbourne, Australia. New roofing and drainage was added, plus the over grown outside enclosure was landscaped. The pool inside the elephants enclosure has been cleared of debris and objects. This is an ongoing part of the project with filtration and drainage still in progress, however the elephants can bath whenever they want. A mud/dirt patch is also available for them to roll around in. Selma and Ira’s journey has been one of compassion and kindness, determination to provide a humane life for these elephants that must remain in captivity. In conjunction with Indonesian Zoos and Aquariums, Taman Safari Bogor, Cee4life and the wonderful open hearts of the staff of Bandung Zoological Gardens, Selma and Ira are unchained. This is a spectacular outcome for the zoo that has battled so hard to provide correct care for the animals under their care. The Bandung Zoological Gardens was been subjected to very unfair and defamatory attacks caused by false information of starving sun-bears. No animal has ever been subjected to starvation inside the zoo, however the living standards always needed upgrading. This is happening now. Please stay with us on the journey of Bandung Zoological Gardens that aims to set a high standard with the hope that other zoos will see this amazing act of humanity and love for the animals in captive situations. The sun-bears are next! We would like to say a special thankyou to Isa and Paula Mckenzie Mun’in for their support, who carried equipment from Melbourne to Jakarta, plus all other contributors. The only things that are impossible is if you say they are. 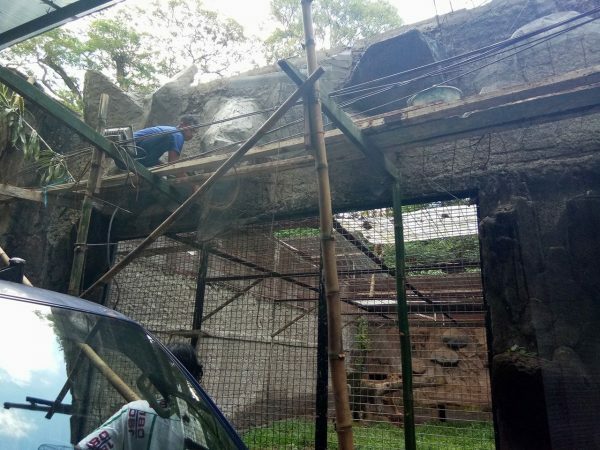 Work on the new enclosures for the sun-bears of Bandung Zoological Gardens (BZG) has now started with hopes for a finish date of early November 2017, all going well. 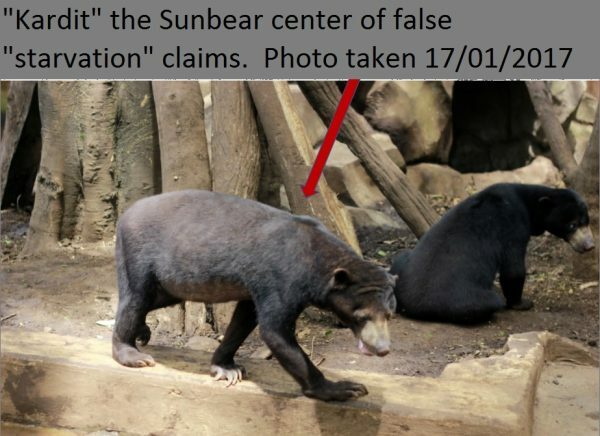 The sun-bears of BZG have been in the world headlines after false and misleading video was released claiming the sun-bears were “starving and begging for food out of hunger”. Sadly, in many zoos, visitors feed the animals. Sun-bears are particularly susceptible to this visitor attention due to their expressive faces and flexible human-like movements. They learn to stand up and reach out when they see people as they have learnt that this will get them food. The BZG sun-bears display this learned behavior and unfortunately the food that visitors gave to them is not part of their diet and can cause illness. Thankfully, the BZG sun-bears have not been badly affected at this time. 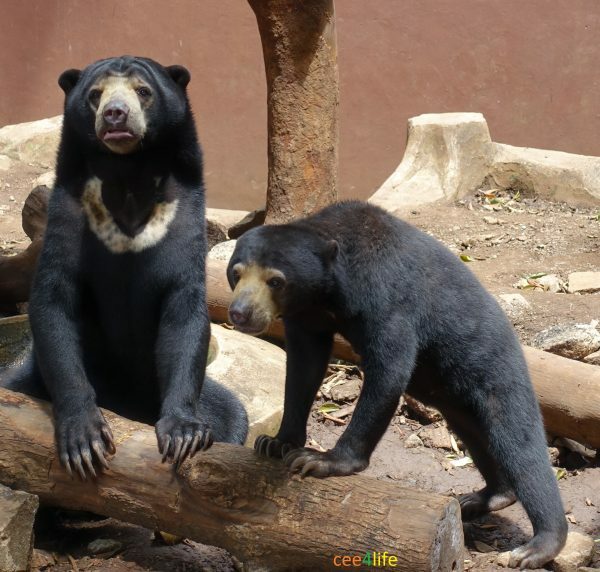 Over the last few months, Cee4life has provided support to prevent the public from feeding the sun-bears by being an active presence at the enclosure sites and educating the public. The BZG has placed “Do not feed the animals” signage all around the enclosures, however it is an ongoing process as feeding the animals is so ingrained in some people. An interesting fact has surfaced – after speaking with foreign visitors to BZG, it was found that many believed the sun-bears to be of the bulk mass of a grizzly or brown bear. The appearance of the sleek small tree dwelling bears surprised many, however once educated on the reality of the small slender physical appearance of the sun-bears, and their natural “built-for-climbing-tree’s” frames, a better understanding of sun-bears has begun. Out of this entire viral episode, the positive is that people are learning about these lovely little bears. At no time has the BZG claimed that the enclosures for the bears were fantastic. 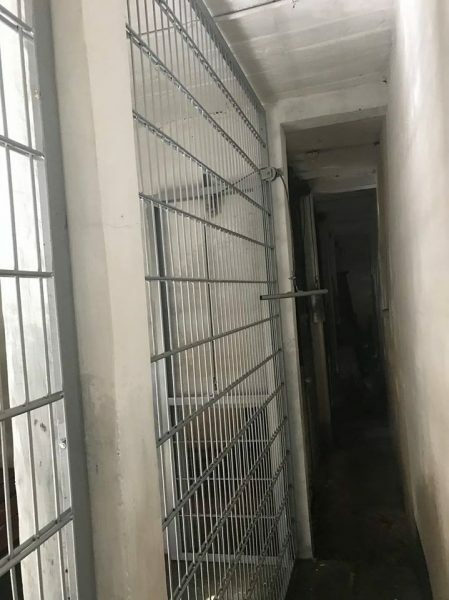 BZG understands and agree’s the enclosures need upgrading and together with the PKBSI (Indonesia Zoos and Aquariums) and Cee4life, the upgrades has begun. The BZG was built in 1933 within a pristine 200+ year old forest. In order to upgrade the enclosures, careful planning has been done to ensure the least amount of impact to the surrounding protected old growth forest. 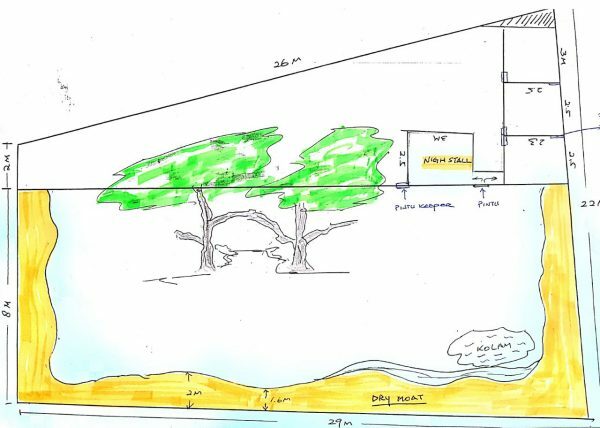 The new sun-bear enclosure is 29m x 16m x 26m x 10m (as seen above L) and will consist of a surrounding dry moat, water sources, 4 x secure weather resistant night/shelter dens, trees, other enrichment items and CCTV. Work began on these new enclosures in late August 2017. The initial construction works began by removing old fencing and removal of debris within the soil. The photo (L) is taken mid way across the the lower dry moat area, the photo (R) from the fence line of the zebra’s enclosure. 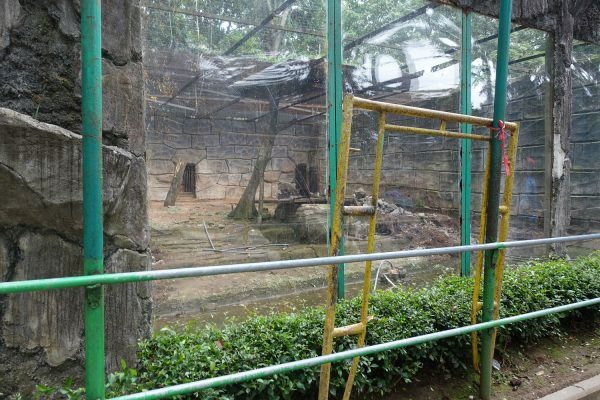 While construction works are going on, the sun-bears remain temporarily in their old enclosures, however upgrades within those enclosures has already occurred. We all wait with anticipation for the enclosures to be completed. It is a mammoth job to complete the upgrade of all enclosures and it takes time and patience to get it all right. We will continue to update as the enclosures progress further. This year on Eid al Fitr (the religious holiday celebrated by Muslims to mark the end of Ramadan), the female tiger, Syla, gave began to get quite restless. Within hours, she had given birth to these beautiful cubs. The two cubs, Asin (male) and Maharani (female), are very healthy and have been flourishing. All was going well, but then one day Syla began to show aggressive behavior towards the cubs. Her behavior became unsettling and it became obvious that it was too dangerous to leave the cubs with her. Asin and Maharani had to be removed quickly from Syla. 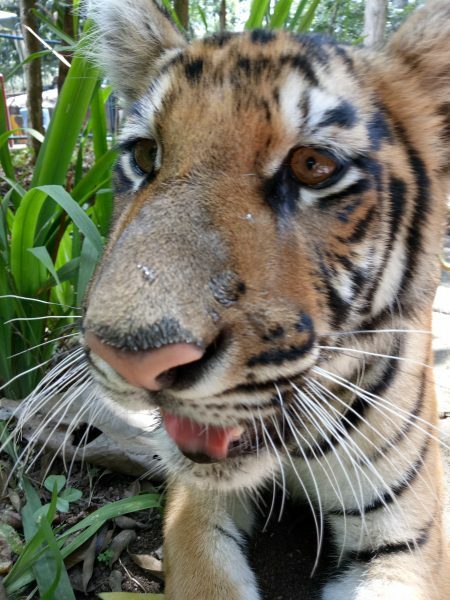 By all accounts, Syla, who was born in the Maharani Zoo, Indonesia, is in very good health for a 9 year old robust female tiger. By all accounts, she has lived a relatively serene life. 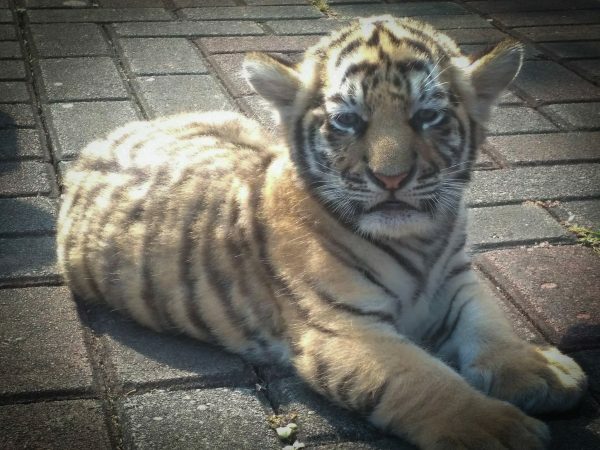 While a case could be made regarding stress factors upon animals within a captive environment, especially those who are not receiving correct diet, correct enclosure sizes, enrichment, or are being used in exploitation for tourist selfies and man handling, such as what was occurring in venues such as Tiger Temple, Syla has never subjected to any of those things. The cases of infanticide and rejection within the wild is nearly equivalent to those in captivity. While Syla is in perfect health and has never previously shown any negative or stereotypical behavior, it currently remains a mystery as to why she became aggressive to her new born cubs. 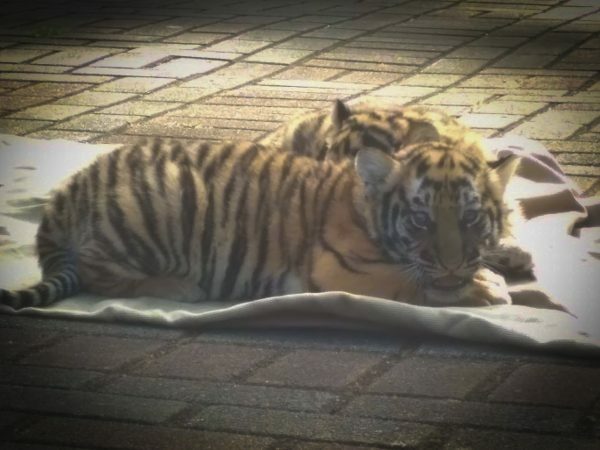 Asin and Maharani have now been removed and are continuing to flourish under 24/7 specialist care of the Bandung Zoological Gardens Veterinarians. With these unexpected new arrivals and turn of events, a rush of activity has occurred to accommodate these beautiful little bengal’s and ensure they remain in the best of health. At this point, the cubs are being monitored 24/7 and being fed throughout the day and night. For all baby mammals, the main source of their diet in the early months is the milk from their mothers. When they have been abandoned or rejected, such a Asin and Maharani have, then a specially made formula is required to replace all the vitamins and minerals which their mothers would have naturally provided. Thankfully, Asin and Maharani had the benefit of receiving Sylas colostrum, which is vital as new born cubs have a tiny stomach and the small amounts of colostrum produced matches infant stomach size, it provides immune protection, colostrum has a mild laxative effect and helps the babies to pass their first stools, and colostrum helps to establish a healthy gut microbiome. 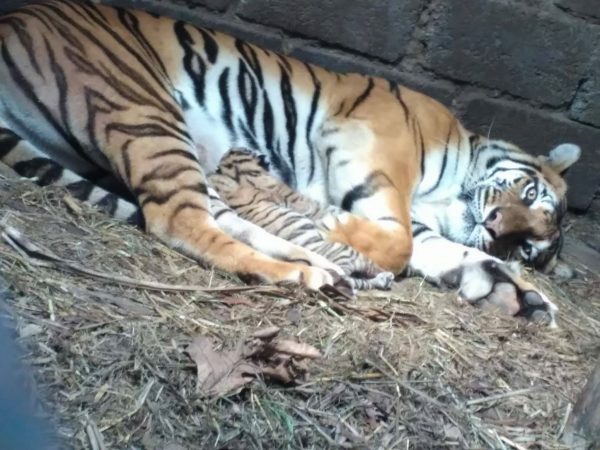 Now, Asin and Maharani, must be given a tiger milk formula to ensure they continue to flourish. As of now, some of this tiger milk formula has been sourced from another sanctuary, however as this formula is not made in Indonesia, there is an urgent need to get more supplies by the end of August. Cee4life has been able to source this formula within Australia via Wombaroo and “Not Just Natives” and have ordered 40kg of the formula which we will deliver on a mercy flight in the next weeks. After the cubs begin to be introduced to meat (at the 3 month mark) they will continue to have milk in their diet until they are completely weened off the milk. At this point, a carnivore supplement will be introduced and the young tigers will have to have this included in their diet for the rest of their lives. The carnivore supplement is also to be sourced from Australia at this time. 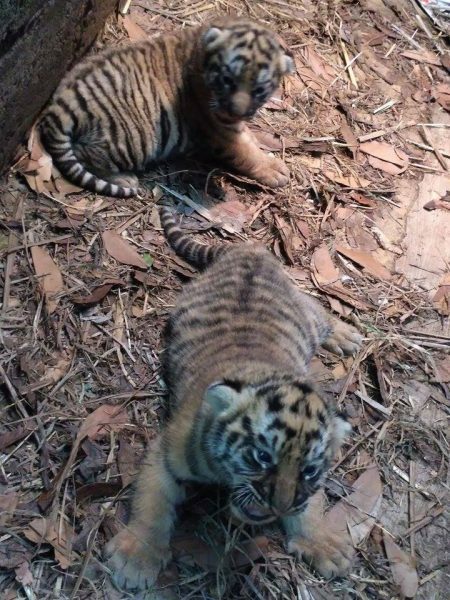 If you would like to participate in helping these precious tiger cubs, please consider a donation. We have created this fundraiser to include offers of visiting Bandung Zoological Gardens and being a part of one of the education programs, where you will get to view (no hands on!) the progress of these precious cubs. We will continue to update regularly on the progress of Asin and Maharani, and look forward to seeing them grow into big and strong magnificent tigers. 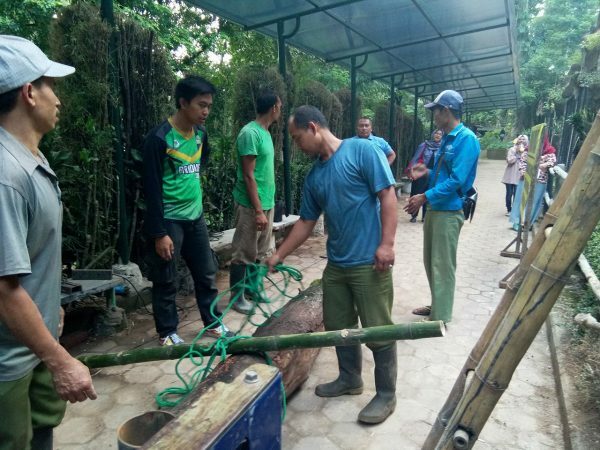 Over the last months, a great deal of upgrading animal enclosures, education and training has been happening in Bandung Zoo. While we would love to see all animals running free, the fact is that around the world, there are millions of exotic animals in captive situations due to the actions of humans. In regard to exotic captive animals, the sad fact is its the human demand that drives the market for interacting and viewing exotic species, mostly via tourism. Although exotic animals should only ever been seen in the wild, the fact is humans put the animals in these captive situations where most can never be released. If they must be in captivity, then we must do our best to ensure that they are provided with the very best standards of living, care and nutrition. In the last 30 + years, breakthroughs have been made in the understanding of the needs of animals in captivity. What this relatively new understanding reveals is that approximately 65% of exotic captive animals across the world are living in sub standard, inhumane and torturous conditions. Within Indonesia, there are 61 zoos/sanctuaries with only four reaching A grade status. The four venues with A grade status are fast approaching their carrying capacity, meaning that there are few vacancies for animals to be re-homed into. 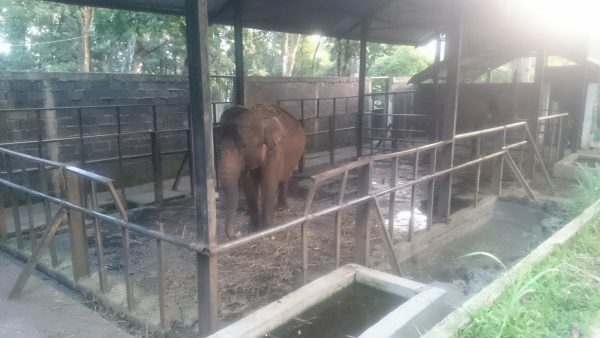 As there is such an overload of captive animals living in substandard conditions which cannot be released in Indonesia, and as the majority cannot be re-homed to overseas locations, the need for building new sanctuaries and upgrading of captive facilities is vital to ensure there is an increase in humane living conditions of captive animals. While it may seem a simple task to upgrade captive facilities in Indonesia, it is in fact a very difficult task. Many of the designs of these zoos stem back to 1930’s and many are in locations which have now become targets for infrastructure development. The complexities that surround some of the zoos in Indonesia are nearly insurmountable. However, once in a while there is a window of opportunity to better the lives of the captive animals. Bandung Zoological Gardens is a privately owned zoo which is getting help from the PKBSI, Indonesian Zoos and Aquariums and Cee4life from Australia. Together we form the Bandung Zoo Team. 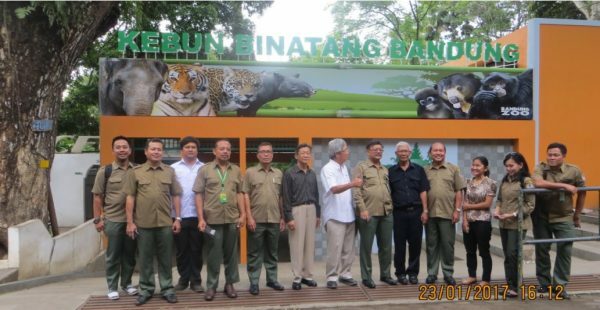 The management of Bandung Zoo has welcomed this assistance to upgrade to the very best standard that is possible. While the PKBSI has taken on the larger infrastructure tasks, Cee4life is helping with the education, training, and the smaller, but still vitally important, tasks for making the lives of the animals more humane. One such task Cee4life has is to help with the upgrade of the elephants enclosure. The old fencing on the elephants paddock has deteriorated under the elements of nature, causing the paddock area to be unusable. 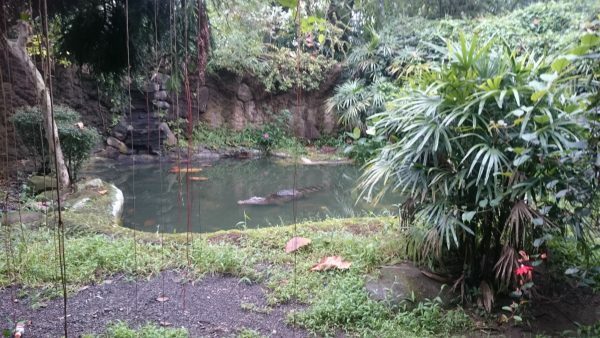 Due to this broken fencing, the elephants have had to be chained to prevent them from walking out and into the zoo. The chaining of the elephants is something that we all know is not humane. Elephants are highly intelligent creatures which require freedom to move at will. Prolonged chaining causes physiological problems, psychological problems and stereotypical behavior. The broken fencing was identified a couple of months ago and we set ourselves a goal of raising enough funding to fix the paddock fencing as fast as possible. 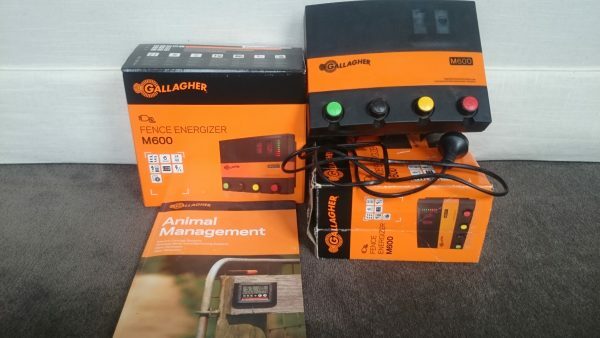 With the help of donations and sponsorship, we have been able to finally purchase the key pieces of equipment, 2 x Gallagher M600, to build and activate the electrical fencing. 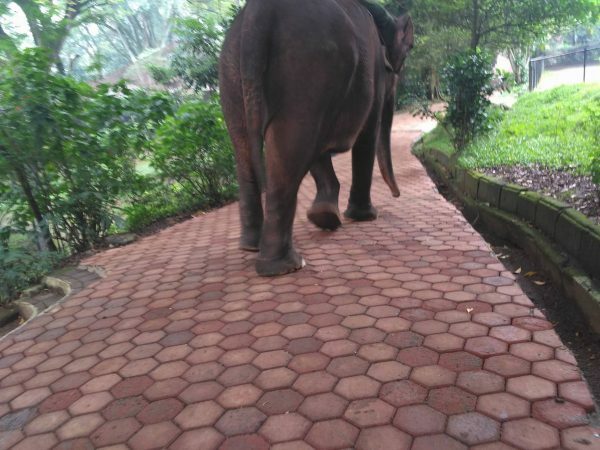 In the meantime we have been able to get the elephants off their chains for large periods throughout the day and walk them long distances around the 14 hectare zoological gardens, in addition to the removal of the bull-hooks. Bull-hooks are a piece of equipment that was only ever designed to be of use in an emergency, however many places carry them openly and have used them as a tool of menace, control and abuse. Although Bandung Zoological Gardens has not used the bull-hook in an abusive manner, through the tools of education and training, they are now not a staple tool of use. The M600 equipment is not available in Indonesia so we had to travel back to Australia, find them, order them, and to get them back to Bandung Zoological Gardens. This has been done now. The next step is to familiarise the elephants with the fencing. Once the we are happy that the elephants are used to the fencing, the next step will be to unchain them completely. We would have liked to have done this alot faster than we have, however we do rely on donations and/or sponsorship and if we dont have it, we simply must wait. However, now its all go and very soon we look forward to showing you the lovely Sumatran elephants, Ira and Selma, chain free. A very special thanks to Paula Mackenzie Munin and Isa Slick for their generous donation, pick up and delivery of items. 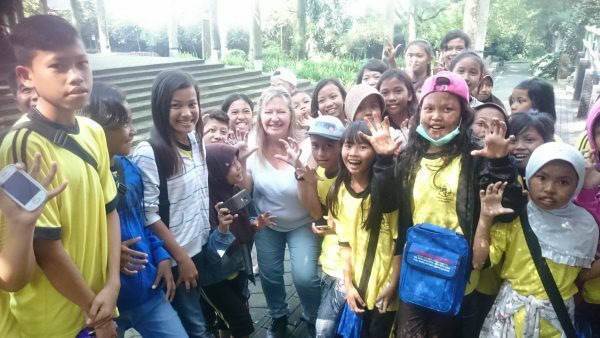 From previous experience of working with the lovely Indonesian people, we were able to easily share information about compassion, kindness and the needs of animals in both captive and wild situations. By breaking the educational information down into an easy understandable way, this produced an immediate compassionate reaction from the school groups and other visitors which were present. We asked everyone to share this information to their family, friends and anyone they saw in the zoo feeding the animals. This was the beginning of a chain reaction of information on compassion for animals to filter out which we hoped would occur. While long term programs are still in progress, we continue to conduct these “roving education” programs and approach anyone who comes into the zoo and provide them with the tools of knowledge. In May 2017, one of the most endearing and heart touching moments came when the Education Team became mobile. 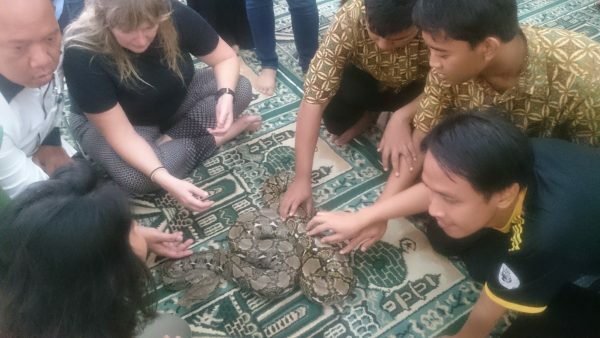 We traveled to the School for the Blind on the outskirts of Bandung City, and took with us a cockatoo, and a python. As this school was for blind children, we created a program based on the senses of touch and sound. These children had never had a program like this presented to them before, and due to their challenges, they had not been able to enjoy the beauty of animals in this way before. 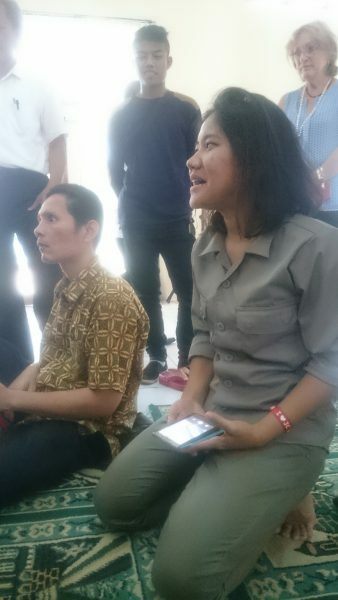 A great deal of translation was needed and it was provided by the wonderful Veterinarians of Bandung Zoo, Josephine Situmorang and Dedi Sasongko, and other members of the education team. The animals used for this program were chosen via risk and safety assessment. When interacting with the animals, the children were guided by the education team to ensure that all went smoothly. The children were taught about each animals unique abilities, the importance of animals in the ecosystem, and why protection, compassion and kindness is needed for all animals. Throughout the program, the children’s band played soft background music and at the end, they presented a most beautiful piece of music that touched the hearts of everyone. We have been asked to come back again to teach more on the animals. We are also in the process of creating a special day for the School for the Blind to come to Bandung Zoological Gardens and further learn about the importance of animals. This has been the most inspirational education program we have been involved in. 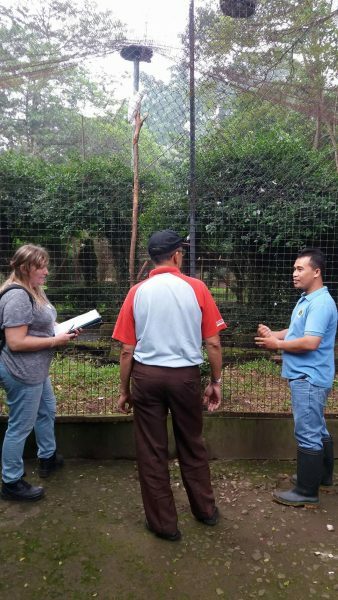 We conducted a three day course for the zoo keepers of Bandung Zoological Gardens with the purpose of providing them with further knowledge on the animals they care for so they are able to talk to the public and provide further education to anyone that comes their way. This was a great and fun time and the zookeepers are the best! Contrary to allegations made by some, there has never been any starving animals within Bandung Zoological Gardens. There has been times of hardship, but never starvation of the animals. The Bandung Zoological Gardens span’s 14 hectares of lush untouched 200 year old + forest. It is situated in the center of the City of Bandung and is the last green area of this size. The botanical species within the zoo ranges from vulnerable species to critically endangered species. From this perspective, the Bandung Zoological Gardens cannot be touched. The zoo itself was built in 1933 at a time in human history where little was known about animals that live in captive situations. In those days, enclosure designs were not good at all. However, since then, leaps and bounds have been made in the knowledge of the welfare of captive animals and Bandung Zoological Gardens is in the process of one of the biggest transformations an Indonesian Zoo has ever committed to. Cee4life has come to know that the staff and management of the Bandung Zoological Gardens are good and kind people who love their animals. They have endured incredibly unfair negativity from around the world due to false information. 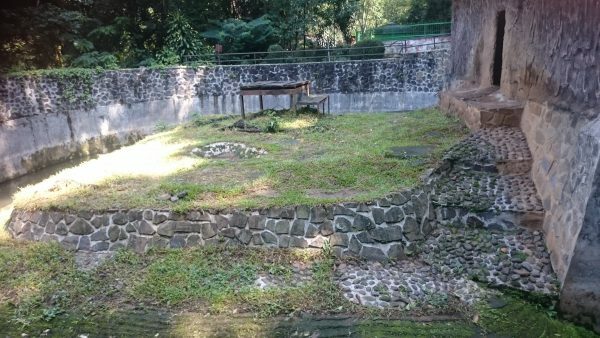 Since May 2016, the PKBSI (Indonesian Zoo’s and Aquariums) has been assisting with the upgrades of Bandung Zoological Gardens. The flurry of activity and upgrades throughout the zoo has been ongoing throughout the last year. One of the first enclosures to be upgraded was the orangutan’s habitat. While all orangutans within the zoological gardens are very healthy, the enclosures of 1933 needed vast improvement. This is being achieved now and the orangutans have a much more ethical living area. There is still further upgrades to go with these enclosures, however this is a giant leap forward for the peaceful life of these animals. The next enclosure to upgrade has been for some of the Sumatran Tigers. 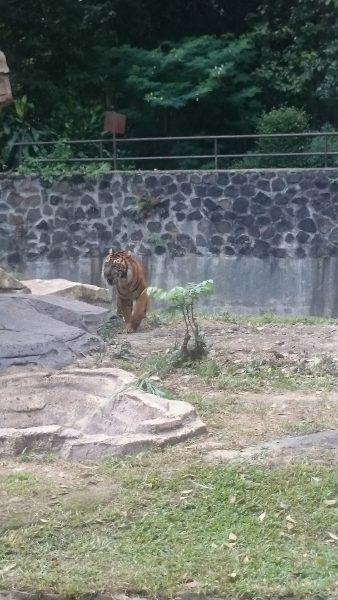 All of the tigers and big cats within Bandung Zoological Gardens are in very good health. However, again the enclosures are in need of upgrading. In May 2017, the first of the big cats enclosures opened for the tigers. The old internal holding dens have been completely pulled down and rebuilt to provide warmth, shelter and protection from the elements and for sleeping quarters. The internal dens also include a “squeeze cage” which is used for providing the tigers veterinary care and health checks. There is room for three tigers in this enclosure however currently there is only two. All animals of Bandung Zoological Gardens receive ongoing health checks and are provided the very best of veterinary care. 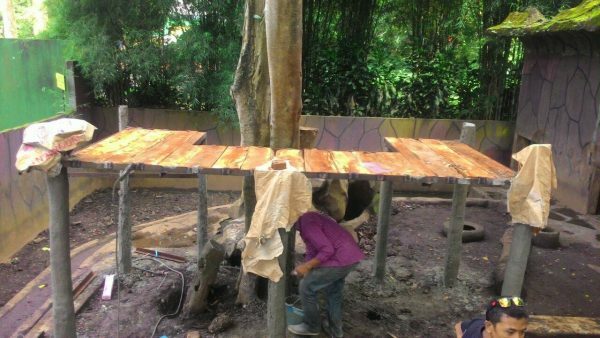 The outer section has been upgraded to include climbing areas, a magnificent platform, scratching posts and stretch food posts to aid with the exercise and enrichment aspects of the enclosure. The tigers currently have a moat around the enclosure, however this moat will be sectioned off to allow a workable swimming section. There is also a second pool area in process, the current pool is smaller than needed and this is being extended. The tigers have been released into this new area already and have shown exceptionable and marked positive behavior. Cee4life will help provide further enrichment to the tigers and they are included in the education programs. Further tiger enclosures will be upgraded over the next 2 years. Cee4life is helping with securing the elephants paddock so the Bandung elephants, Ira and Selma, can be let off their chains forever. 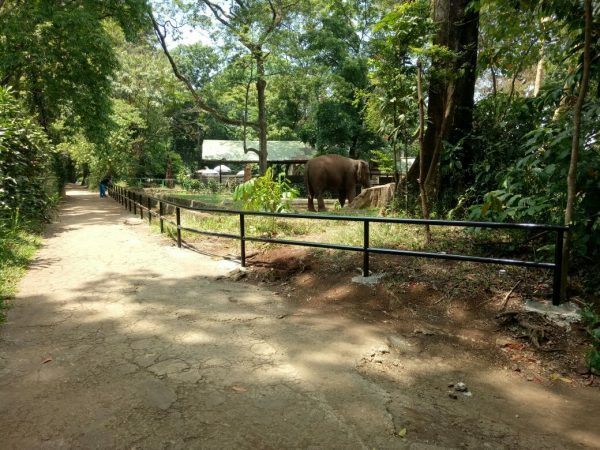 The situation is that the elephants holding den currently needs new bars to prevent them from wandering out into the paddock, and the paddock needs new fencing to prevent the elephants from wandering out into the zoo. Previously, the chaining of the elephants was extreme, with three legs chained in the holding area. Through excellent communication and education, the elephants are now getting completely off their chains for large periods of time throughout the day by walking them around the zoo. We have also been able to end the use of bullhooks. Bullhooks are a vile looking piece of equipment that was only ever designed for emergency situations. In some areas of the world, the bullhook was morphed into being used daily, regularly and a constant. It became a tool of absolute abuse, especially in the horrendous Phajaan training. After speaking with the staff with translations, the bullhooks are now gone. We hope that you will join us and continue the journey of Bandung Zoological Gardens and the goal to create a beautiful home for the animals. While we wish that all animals were running free, we humans placed animals in captivity and most can never be released. So we must strive to give the captive animals the very best living conditions that we can. They depend on us to keep them safe from harm, to provide them with correct diet, enrichment, veterinary care, peace and protection. Within Indonesia, there are approximately 61 zoos, with only 4 that are A grade status. Safe and ethical places for the captive animal population is very needed. Thankyou from all at Cee4life and the Bandung Zoological Team. Bandung Zoo (Kebun Bintatang Bandung) is situated in the City of Bandung, West Java, Indonesia and covers an area of 14 hectares. The zoo itself was built in 1933, and in those days people thought that digging a hole in the ground and throwing an animal in there was ok. As human beings have become more educated as to the needs of animals that are in captive environments, we now know that these types of enclosures are not a healthy living environment. While there has been a variety of animal deaths over the years, the causes of these deaths has never been from starvation. The begging of the sun bears is learned behavior caused by people feeding the animals. This is one of the many things that visitors must be prevented from doing and educated on the reasons why. The cause of the elephant, Yani’s, death will be revealed in the near future. 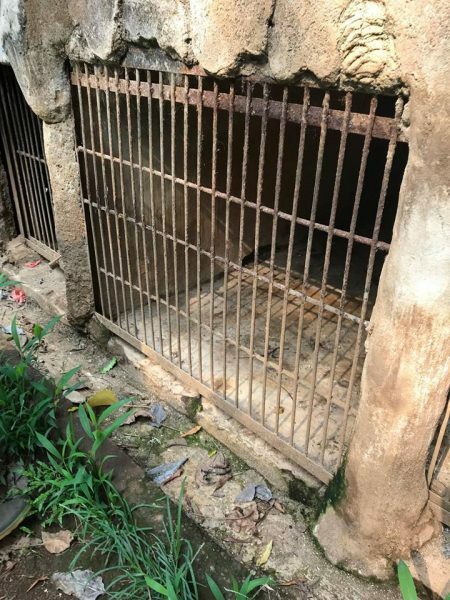 In January 2017, Cee4life was contacted by multiple concerned animal lovers who had viewed a video purporting to show “starving bears begging for food” in Bandung Zoo. We immediately contacted the Chairman of the Indonesian Zoo’s and Aquariums, Dr Tony Sumampau, who reassured us that no such thing was happening, and in fact no animals were starving within the zoo. We received detailed reports and photographs which showed the reality of the situation. While no animals were immediately starving, other urgent actions are needed. We arranged to visit the zoo in March and April 2017 to see the condition and how we could help the animals. 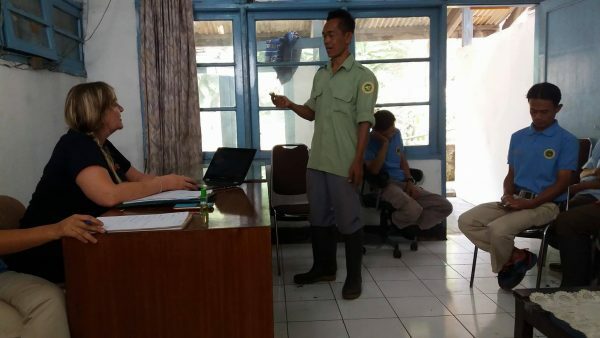 The Indonesian Zoo’s and Aquariums have been helping the zoo for the last year, but on meeting with the management we have found our help is very needed and has been very welcomed. Our visit has found that the current situation is balancing on a knife edge and could go either way. There are 3 vital factors that convinced us to help. 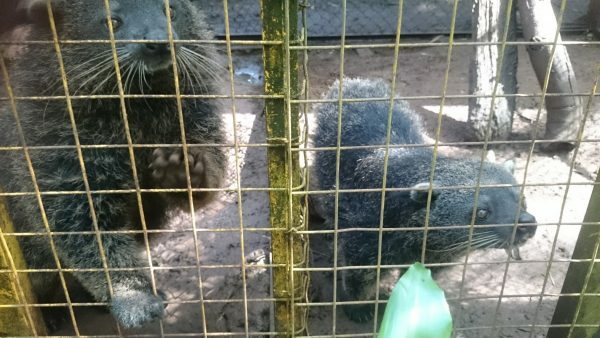 1) The animals in Bandung Zoo are very loved but need a lot immediate and urgent help. 2) The old growth forest containing critically endangered plant species that need to be absolutely protected. 3) Out of no wrong doing of their own, the management of Bandung Zoo have fallen on hard times. Realistically, if help is not provided immediately and efficiently, then the situation has the potential of declining rapidly. We have always known that education action is one of the most vitally important keys in protecting animals, whether animals are wild or captive. Education has the potential to stop up and coming poachers, to stop animal abuse, to save habitat, to create a network of protectors in some of the most environmentally impacted areas and to protect what is left of wildlife. From our base in Bandung Zoo, we will filter these education programs across SE Asia and into India, and wherever else we can. Teaching compassion towards animals is much needed and from previous compassion programs we have implemented, we have seen amazing and ongoing results. All it takes is to do it. 2 minutes of education stopped these children and their teachers from feeding the bears. If you have ever wished that you could help a zoo in need, this is your chance. We will do ongoing updates of this very important project and hope that many of you will join in, visit and support these very humane efforts. Please help us help these animals and educate as many people as we can on compassion to the animals. 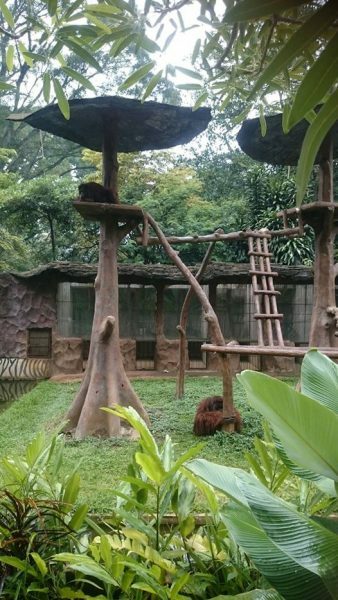 Ultimately, one day we would like to say this is Bandung Sanctuary, not Zoo. 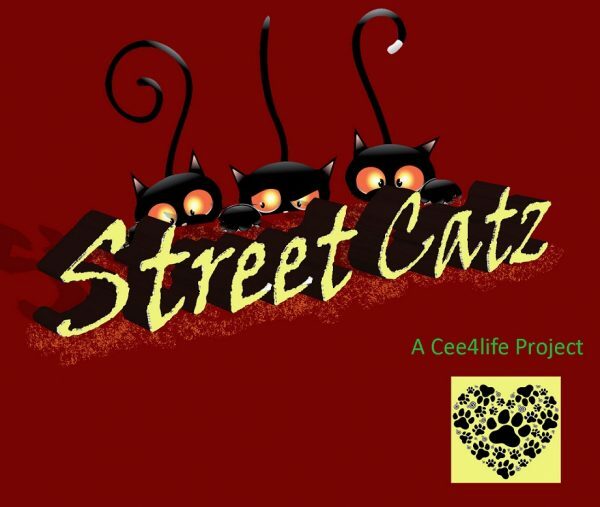 This is an ongoing project where we will help rescue, rehabilitate, re-home or release the street cat population in Australia and abroad whenever we run into homeless, dumped or “born on the street” cat. We also provide education to potential cat owners/buyers on their responsibilities to animals under their care. The origin of most street cats has come from people who have dumped and abandoned a cat that they either bought or was gifted to them and for some reason they do not want anymore. This is an ongoing project since 2010 where we help wherever we can with these deserted, dumped homeless cat population.